• Semi-quantitative detection: 18 + 50 + 150 ng/ml. 3 levels of detection in a single test ! This test does not only deliver a simple positive or negative result. It shows in addition if the concentration of THC in urine is LOW, MEDIUM or HIGH. This test is particularly effective over time. Initial screening will serve as a baseline, while the tests that follow will see the lowering or raising level of THC in urine. By practicing regular screenings, it is now much easier to see if the subject has stopped its consumption (steady decrease in the level of THC) or if he can get re-smoking (sudden increase in the level of THC). A new tool to assist a patient or the progress of a withdrawal. Encourage and motivate those who decide to give up marijuana is an integral part of the assistance they need. This is one of the major advantages of this test: it allows the patient to see by himself that his metabolism is eliminating the residues of THC. Efforts are therefore represented by a real and practical tool, which helps to maintain motivation, because it is possible to say "Look, your efforts are useful! Your THC is decreasing. Hang in there, it works! " 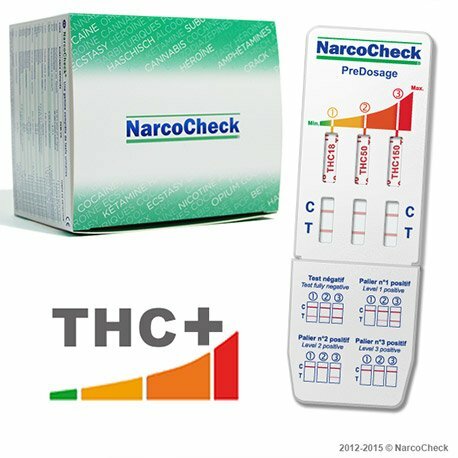 React quickly: the NarcoCheck THC PreDosage test allow to maintain a vigilance by monitoring the regression of THC in urine. During this process, if the THC level is suddently raising, this could indicate a possible relapse, so a medical reaction can take place without wasting time. Conversely, if the withdrawal is met, the former consumer will see its positivity to THC reducing level by level to achieve a completely negative test after a few weeks. This first full negative test can also be used as a real psychological help for the patient, because keeping it may symbolize the detoxification of his body and the victory over addiction. This test will be positive for cannabis on Level 1 if the sample tested contains at least 18 nanograms of THC per milliliter of urine, positive on Level 2 if the THC rate is greater than 50 nanograms per milliliter of urine, positive at Level 3 if the THC rate is greater than 150 nanograms per milliliter of urine, or totally negative if the sample contains less than 25 ng/ml or not at all. 2 to 3 days for occasional consumption. 5 to 10 days for more or less regular consumption. 14 to 30 days for a high consumption, and even longer for chronic use.